With the right ladie's walking shoes, the beauty of hiking is doubled! Women can choose from a variety of reliable, comfortable hiking shoes and boots. You're sure to find the right model for challenging day tours, cozy hut tours, and multi-week wilderness trips. 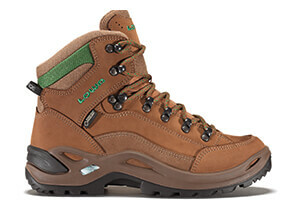 Women's walking shoes and boots are built for moderate endeavors in low mountains. Walking boots for alpine and high alpine terrain have a different construction. This is evident in their upper material, lacing style, rigidity, and soles. There are also variations in the shoe sole. Vibram has the right profile and rubber compound for every purpose. Leather or synthetic fibers: Durability counts! Women's walking shoes can be made of leather or synthetic fibers. Either way, proper care has a minor effect on longevity. If the wearer chooses the right products, she'll be happy with them for a long time. Modern hiking boots often combine leather or suede with robust synthetic fibers. Classic models are often made entirely of leather. Women and shoes - this theme has its own special role in the field of outdoor goods. First, a walking boot must fit well for hiking, trekking, and mountain hiking alike. It should guarantee comfortable movement throughout the day. And of course, it should also look nice! But high-quality women's models aren't merely smaller, differently-colored versions of men's hiking boots. A woman's foot shape differs from a man's. Trusted manufacturers such as Hanwag, Lowa, Mammut, The North Face, and Salewa have women's walking shoes with narrower lasts that suit their anatomy. This is the core of every good hiking shoe and the basis of an optimal fit. The upper material, lining, and features influence foot climate and comfort. A Gore-Tex membrane keeps moisture and wetness out. Moisture can escape to the outside at the same time. So it's important for a walking shoe to be waterproof and breathable.